Thyroid nodules are small lumps that develop in your thyroid. Lots of people have them. Some nodules are picked up because you or your doctor feels them in your neck and others are picked up by accident when you have a scan to look at something else. Doctors don't know why these lumps develop in your thyroid. However, most are harmless (they are benign), but occasionally they can be caused by thyroid cancer. If you have thyroid nodules you might not have any symptoms. However, you might notice a lump in your neck or a croaky voice, difficulty swallowing or a cough. If you get these symptoms then you should see your doctor to get the lump checked. If the nodule is making your thyroid overactive, you may have symptoms of hyperthyroidism. If the nodule is making your thyroid underactive, you may have the symptoms of hypothyroidism. If you have a thyroid nodule you will need a blood test to check the hormones that your thyroid is making. Your thyroid nodule might cause your thyroid gland to be overactive (hyperthyroid) or underactive (hypothyroid), or it may not cause any difference in the level of hormones your thyroid makes. radionuclide scan – this is a type of scan where you swallow a small amount of radioactive material that the thyroid gland takes up. Your treatment will depend on what is causing your thyroid nodule. If it is benign (not cancer) you may not need any treatment, but the doctor will monitor it to make sure it doesn't get any bigger or start to cause problems. If it is overactive, then your doctor may suggest you have radioiodine treatment, or surgery. If the nodule is full of liquid (a cyst) then it can be removed with a small needle, or with surgery. If you doctor suspects the nodule is cancer, then they will recommend you have surgery to remove it. 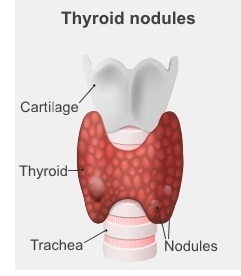 More information about what causes thyroid nodules and how they are treated.